Looking for that perfect holiday brunch for the 4th of July weekend? These Mexican Breakfast Haystacks are super easy to make and I guarantee they will impress your family! They have the perfect balance of creamy avocado, crispy potatoes and a kick of salsa. On a side note I am trying something new so I made you a video on how to assemble the Mexican Breakfast Haystacks. Let me know what you think in the comments below. Thank you! To get things started wash the potatoes then place them on a plate and microwave them about 5 mins (I used my microwaves baked potato setting). If you are making brunch for a large group feel free to do this the night before. In a skillet add the oil, chopped potatoes, salt and pepper. Cook over medium until they are to your desired doneness. I love mine extra crispy so they tend to take a bit longer. While the potatoes are crisping up peel and slice the avocado. You know how when you go to a restaurant how the slices look perfect vs the mad murder scene that mine look like? Well I learned a neat little trick to have the perfectly sliced avocado EVERY TIME! Just slice the avocado into quarters then peel back the skin at the top. If the avocado is ripe it will remove easily; then you can slice it. Tara! the perfectly sliced avocado. You’re welcome! Place the avocado on the plates. Next place the potatoes in the middle of the plate. Once the potatoes are plated use the same skillet to cook your eggs (as you know I hate to dirty extra pans). I made mine over easy but you can cook them however you like. Once the eggs are cooked place them on the potatoes. Pour the salsa of the eggs then sprinkle with cheese (if desired) and sliced scallions. That my friends is a Mexican Breakfast Haystack. You can always feel free to mix and match the toppings things like black olives, black beans, chorizo, diced fresh tomatoes all might be a great addition. Enjoy! These Mexican Breakfast Haystacks are super easy to make! They have the perfect balance of creamy avocado, crispy potatoes and a kick of salsa. While the potatoes are crisping up peel and slice the avocado. You know how when you go to a restaurant how the slices look perfect vs the mad murder scene that mine look like? Well I learned a neat little trick to have the perfectly sliced avocado EVERY TIME! Just slice the avocado into quarters then peel back the skin at the top. If the avocado is ripe it will remove easily; then you can slice it. Tara! the perfectly sliced avocado. You're welcome! Place the avocado on the plates. 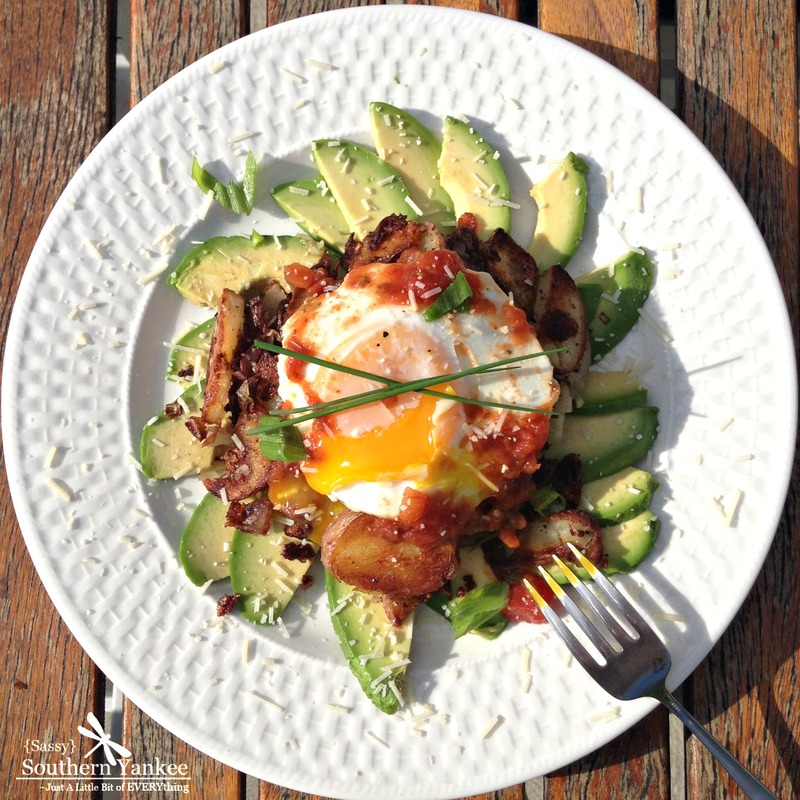 This entry was posted in Breakfast and tagged Avocado, Breakfast, Brunch, Easy Breakfast, Eggs, Haystacks, Healthy Breakfasts, Mexican, Salsa, Skillet Potatoes, Whole 30, Whole 30 Recipies.